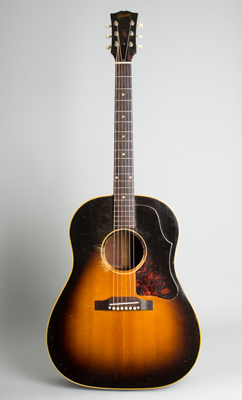 Gibson J-45 Model Flat Top Acoustic Guitar (1956), made in Kalamazoo, Michigan, serial # V6802-23, sunburst top, dark back and sides finish, mahogany back, sides and neck, spruce top, rosewood fingerboard, black hard shell case. Gibson's signature slope-shouldered Jumbo flat-top guitars have remained extremely popular since the 1930s with folk, blues, and pop players, and picking this one up it's easy to see why. This 1956 J-45 is a very comfortable guitar with a sleek, round neck, much less chunky than the late '40s versions, and a powerful but still sweet sound. This example has era-specific features including the later style extended tortoise celluloid pickguard, "belly up" rosewood bridge, gold decal "Gibson" block script logo, and Kluson Deluxe strip tuners with plastic buttons. The triple-bound sunburst top finish has a subtle shading in the darker look typical of the period. The J-45 is the absolutely classic Gibson Jumbo that has proven the company's favorite flat-top offering over the years, loved by players in many styles. Overall length is 40 1/2 in. (102.9 cm. ), 16 3/8 in. (41.6 cm.) wide at lower bout, and 4 15/16 in. (12.5 cm.) in depth at side, taken at the end block. Scale length is 24 3/4 in. (629 mm.). Width of nut is 1 11/16 in. (43 mm.). A well-played but not abused guitar, with some wear but no major damage or alterations. The finish is noticeably checked on the body, with a lot of fine checking and some flaking to the lacquer on the headstock face. The finish shows dings and checks overall and there is pickwear through to the wood around the sound hole. There is a spot of patched-in clear lacquer on the side of the upper bass bout, a spot where the handle pins inside the original chipboard case often wore into the finish; an odd but not uncommon J-45 situation. The only crack visible is just off the treble side of the fingerboard on the sound hole rim. The neck has been reset and the original full-height bridge is still intact, with neatly patched-in rosewood spots on the wings where someone must have put pearl dots at some point. The guitar otherwise remains in original condition with these exceptions: the bone nut and saddle are replaced, the tuners are newer repro Kluson Deluxe, and there is a strap button added to the heel. The fingerboard has some divoting in the lower positions, but the frets are good and this is a very nice playing and sounding '50s J-45, worn in enough to have some stories to tell. Very Good + Condition.